Grown in organic, biodynamic, dry farmed vineyards and harvested by hand, natural wines are about creating a connection to the terroir. Interesting blends from vines planted 120 years ago and rare varietals like Abouriou can be found here. Pastoral Winemaker, Darek Trowbridge celebrates the diversity in the vineyard, creating wines that are both interesting and delicious! Nothing is added to the wine except a minimal amount of protective sulfur in barrel. Darek feels using yeast from the vineyard is the best way to express the natural beauty in that wine. Planted by Darek’s great grandfather, Giuseppe Martinelli, in 1890 these vines have been continually harvested for 120 years. Muscadelle, Tousseau Gris, Palomino also known as Golden Chasselas, Mondeuse Noir, Abouriou, and Zinfandel. The vineyard is on shale soil with plenty of rock in the strata. These vines are not trellised or irrigated, they are the old head-trained bush vine technique that has worked for hundreds of years. This heirloom varietal, is the only 4-acres of Abouriou, that exist in the entire New World. 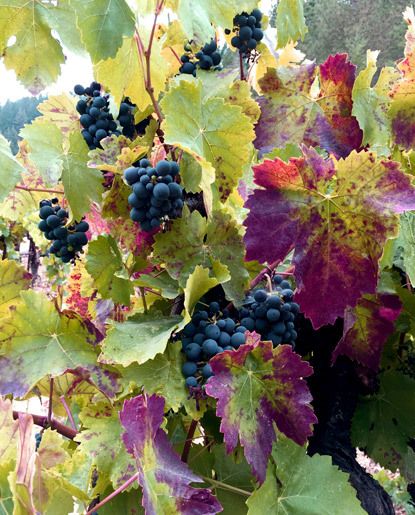 A Basque variety, these gnarly, ancient vines are head-pruned and eek out a very small crop load each year, resulting in a dark, extracted and ripe, red wine.This vineyard is on a slight south-facing slope in a small valley surrounded by tall trees blocking out breeze and getting hot on sunny days. Approximately 3.4 million years ago a volcano erupted at Mount St. Helena in Napa, spreading an incredible amount of debris all over the Mayacamas Mountains. The Fountaingrove District (circa 2015) is an newly named area within this volcanic zone of the Mayacamas. The resulting iron rich clay soils contain immense amounts of volcanic rock within them. The vines are planted directly into this “debris soil”. The area was also in the center of the October 2017 Tubbs Fire in Sonoma County in which the vines burned. The vines will be assessed in 2018 for the amount of damage, i.e. dead vines, from the fire.